Harper starts in RF today. Velasquez on the mound. Kingery in CF. Interesting to note Gift Ngoepe has been added to start at second. Up to now I've been able to watch spring training games easily enough as 1pm was 6pm my time so I could start watching as I left work. Your daylight savings time is a couple of weeks earlier than in Europe however so now 1PM is 5PM my time so I'll have to either listen to the radio broadcast or sneak a look at my phone. Apparently Velasquez has made some changes to his motion, which probably explains the abbreviated first outing a bit. Easier to work on stuff in the bullpen. Will be interesting to see if he settles down this time. Ngoepe was one of the non-roster signings a couple of months ago with guys like Romine. I think he was delayed a bit in camp. Certainly an interesting story as one of the few African major leaguers, though also seems destined for AAA depth. I read somewhere (no link) that Ngoepe was delayed due to visa problems. Good to have him in camp. I saw another tweet suggesting David Robertson and Jared Eickhoff will make their spring debuts today as well. Can't find it now though.Definitely a game worth paying attention to today. Note that Robertson is not hurt. He limits his Spring activity to save himself for the regular season. Only 5 outings in the Spring the last few years. Eickhoff of course is a significant question mark. AL Cy Young winner Blake Snell pitching for the Rays. Kingery starting in CF today. Like the idea of having him learn as many positions as possible, but if Hernandez is going to start on the DL then I would imagine Kingery is the starting 2B right? Hererra, Eickhoff, Hunter, Quinn and Hernandez have all been injured this Spring. Will any of them be ready for opening day? I would imagine Altherr or McCutchen would start in center if Hererra is on the DL. Kingery should be credited with an error. He had the ball at the fence but closed his glove too early. Velasquez is struggling today. Bases loaded two run double off the top of the wall, inches from a grand slam. Only one out in the second inning so far. And as I'm typing a two run single clears the bases. Tom McCarthy mentioned in the beginning of the broadcast that they have Vince working on some stuff, just using a couple of pitches so its not a death knell for Velasquez but its not promising. el, you are correct on struggling. he makes some darn good pitches ( on the black fastballs and slider) but the rest of his fastballs are groovers and they get drilled. does he have a change up? I could be wrong but I think TMc said they didn't want him using his Curve and Change but I don't remember exactly. just started watching and i missed that. i t did look like he hung a curve to that right handed batter and he drilled it to left for a single. lucky not more. The right-hander altered his mental outlook and worked this offseason to tweak his delivery. "Velasquez’s old throwing motion began with his hands at his waist before he would raise his glove in front of his face. He then dropped the glove back to his waist as he turned his hips and then raised the glove again to his face before releasing the pitch. “There was just a lot of movement,” Velasquez said. 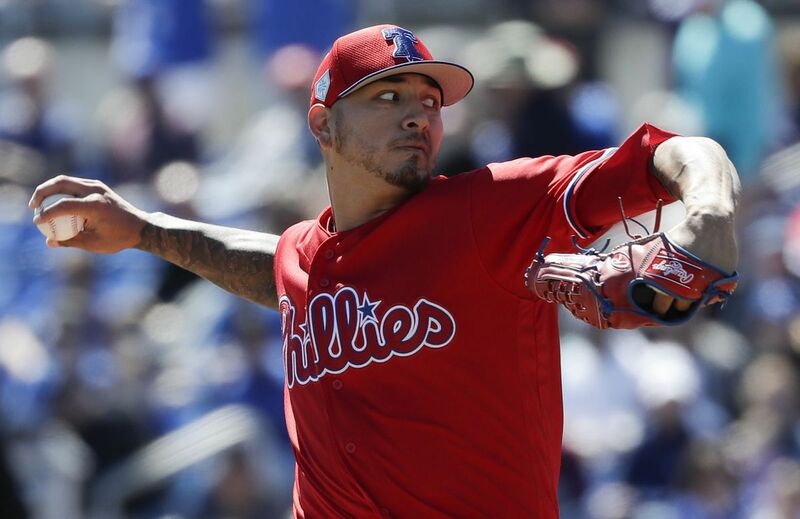 Velasquez unveiled his new look on Wednesday as he threw 27 pitches against the Blue Jays. It was simple as Velasquez centers his glove to his waist before lifting his hands over his head, adding a new wrinkle to his delivery. He then brings his glove back down and fires home. He wanted to work quicker on the mound and has already seen benefits with his secondary pitches." The Phillies might not need a fifth starter for first week or so of the season, so I wouldn't be surprised to see VV start the season optioned to AAA. When they need the fifth starter, they can bring him back up if he is pitching well or bring up another pitcher who is. Not too surprising that he takes some lumps if he is working on something new and limiting his selection of pitches. This is especially true if they have let the word out that he is limiting his pitch selection. Still, not a happy thing to see him hit around again. Good news, some good pitching from Robertson, Neshek, Rios, and Morgan (combined no hits, no walks, 8 Ks) and even Nicasio looked good in spite of a walk. Home runs from McCutchen and Segura but only four hits total, so not a shining day for the offense. Harper 0 for 1 with a walk. Guess he now has a BA of .000 and an OBP of .750. We are still in that part of the spring where we see many minor leaguers in the games. Phillies trimmed their spring training roster again. Pitchers Austin Davis, Enyel De Los Santos, Edgar Garcia, Cole Irvin and Tyler Gilbert were sent to minor league camp. Looking forward to seeing what E. Garcia does. After yesterday and I know it is only his second game, but is it time to start thinking about VV to the pen, AAA or the trade table and seeing Anderson make the opening day roster??? VV is working on a new delivery and was asked not to use his change-up or curve yesterday. Not really fair to judge him off that outing. Honestly, they should be working him on the back fields until he's comfortable with his new delivery, or in minor league games. When did spring training games became so important that you can't, y'know, train? I mean, I know it's getting later in the month, but I think it's still okay to work on things in a game and I also suspect that with today's off-day they wanted to get Eickhoff and all those relievers in too (though maybe not for 7 innnings). I'm not reading too much into anyone's performance, good or bad. The fringe hitters who look good aren't doing it against great pitching (uniformly) and just because Eflin looks better than VV now doesn't mean he will be in-season. I hope so, but I really don't get why people view Velasquez as the most fringe of the starters. To me his body of work still puts him ahead of Eflin just like he was ahead of Lively and Eflin last year. And they all finished last season badly. Also, there's no room in the bullpen. With the way the schedule is, it will be interesting to see who really does end up starting in Allentown. But nobody from AAA is cracking this rotation in April or May (barring injury). If they really are re-tooling VV more than the other guys maybe it makes sense that he's the #5 to start. I don't really take pitchers seriously until the last couple weeks when they're getting into season form and start working 4-5 innings. Until then it's just see what they have. Velasquez has the velocity, after the 1 inning, 95-96, slider had break but struggled to locate. Eickhoff looked good, 91-92 t93, that's the kind of velocity he needs to be effective. Curve looked good as always, decent slider, didn't notice a changeup - that's the key pitch for him, makes it hard to sit on the FB, whereas you can recognize the spin on his curve (even if you can't hit it) and if he doesn't get it up in the zone lay off it. With the lineup the Phillies have, I think their starting depth will be the game changer - Eickhoff as #6, with De Los Santos right behind him, and Romero, Suarez, Irvin and Anderson. Injuries will happen (how many staffs get through a season with five starters throwing 30 games?). If you have replacement plus guys ready that's a big edge over most teams. If I were the GM and I really thought Velasquez (or Eflin) wasn't up to the task, and that Eickhoff can't be trusted, I would go get Keuchel or Gio, not turn to Anderson or any of the AAA guys. I think they can go with what they have for now. It's only the third-best rotation in the East of course, so it's really about how well they hold up and how well the offense does in these first two months. At this rate Keuchel would fit right into a team's April rotation, in that he might not be ready to pitch until 2-3 weeks into the season.